Whether you want to cook corn on the cob, or remove the kernels and use them in other dishes, these recipes are fresh, yummy, and easy to pull together. They all keep something important in mind: corn is in season in summer. That means lots of salads, lots of other summer produce, and lots of quick recipes with very little fuss about them. 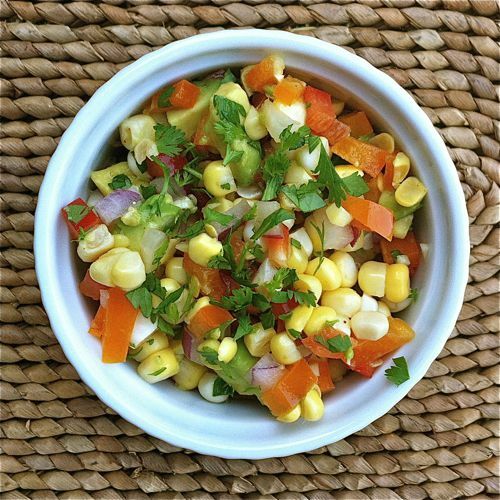 Luscious and kicky, this Corn Avocado Salad works equally well as a salsa for chips, as a topping with grilled chicken or fish, or all on its own as a salad. There's nothing wrong with traditional creamed corn, but there's also everything right about this spiced-up, coconut milk version. Get the recipe for Coconut Creamed Corn to see for yourself. Corn Fritters are sweet and delicate. While they are perfection as an appetizer or first course, at less formal meals I've been known to put them center stage, add a salad, and call it a light summer supper. Simple sweet corn, ripe tomatoes, and fragrant basil become more than the sum of their parts in this Corn Tomato Basil Salad, a creation that shows as well as anything could that truly tender sweet corn can be eaten crunchy and raw. Similarly bright and light, with even more crunch, is this Corn Cucumber,Tomato Salad. There is a brief window of time each year with sweet corn and fava beans are both in season – at the end of the fava bean season and the start of the sweet corn season. At least once each year I like to seize the opportunity, cut kernels from corn cobs and shell fava beans and make this delicious Fava Bean & Sweet Corn Risotto. For a similar but much simpler dish, try Rice With Sweet Corn & Sweet Peas or Sweet Corn Polenta. Souffles have a bum rap as being really complicated and tricky. See how far from the truth that is by giving this Fresh Corn Souffle a try. This Grilled Corn Salad uses the kernels from grilled corn on the cob and adds a brightly spicy dressing and plenty of fresh herbs—a killer at barbecues and backyard parties. This luscious Sweet Corn Soup is delicious hot or chilled. Top it with roasted chiles or fresh summer herbs (like basil or cilantro).